Basundi Recipe is usually made during the festivals like Diwali, bhai dooj, raksha bandhan, gudi padwa or any special occasions. 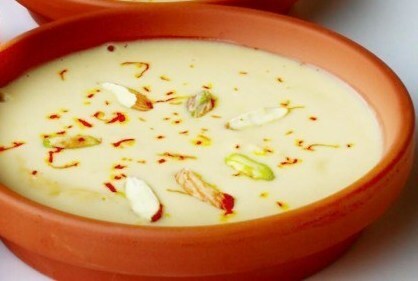 In Gujarat, you may see Basundi in the menu during wedding functions. You can have this during the vrat or Navrastri fasting as well. Boil milk at slow flame. Stir and boil approx 40-45 minutes till milk becomes thick. Now add sugar in it and boil till sugar dissolve. Cool it properly and keep stirring. Now mix saffron, almond, pistachio and cardamom powder. Stir well. Keep in a refrigerator for 5-6 hour before serving.